Substrate: Pasteurized straw, Hardwood chips and sawdust, various grains,newspaper and cardboard. 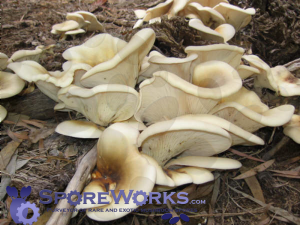 The Pink Oyster is an extremely fast growing mushroom that fruits easily on a wide range of ligneous substrates. The mushrooms grow in clusters of thin fleshed pink caps. The flavor improves dramatically with thorough cooking. Mushrooms tend to be sour when raw or undercooked. 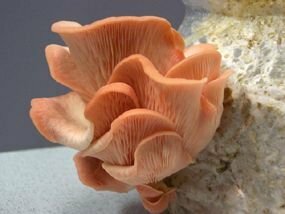 The Pink Oyster is more productive than the Golden Oyster with yields similar to the more common market oyster strains. 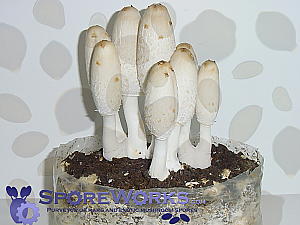 These mushrooms also need plenty of fresh air to develop normally. High carbon dioxide levels from mushroom metabolism will accumulate in sealed growing environments and may reduce cap size severely. Growth starts off as a fast growing white mycelium that ages to a pink color. Primordia and young mushrooms are bright pink but become less intensely colored as the mushroom matures. The color disappears entirely after cooking.